This Chicken Paillard with Fresh Fig Salad and Blue Cheese has turned out to be one of my all time favorite chicken recipes! I’ve had a lifelong fear of figs. I blame it on my Swedish grandmother who lovingly baked sweets that she wanted her precious only young grandaughter to try. Among these treats were cookies with fresh fig filling. Though I loved grandma and appreciated her spoiling me endlessly, I couldn’t stand the texture of the fig cookies. Grandma was hurt. Whenever I didn’t eat what she made, she was hurt. So I ate them anyways and pretended that I liked them. Yuck. And I haven’t touched figs since… until I made this recipe. When we lived in San Diego, we had the good fortune of having a Farmer’s Market near our house that was open every day (Chino Farms). It was one of those good ones too… where they grow all of their own food right there and put out whatever is ripe that day. I was there one time to pick up some of their famous Chino Corn when I spied a small basket of fresh figs. Hmmmm, I thought. Perhaps I’ll give them a try. Mind you, it had been a good 30 years since I’d had figs. So I carted home my basket of freshly picked figs and browsed cookbooks. 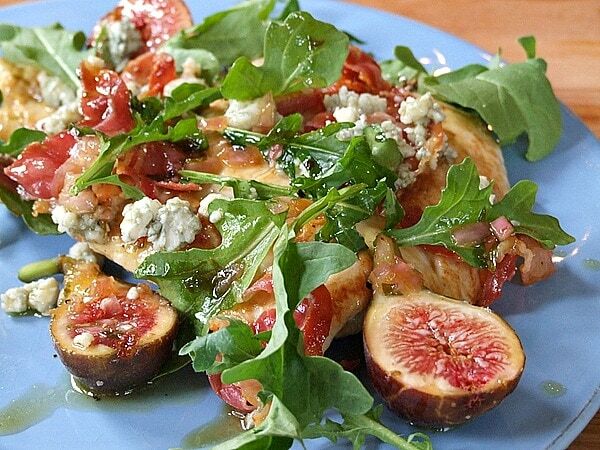 Tyler’s Ultimate had a recipe that looked like a must-try: Chicken Paillard with Fresh Fig Salad and Blue Cheese. I was very surprised to find that I love this recipe so much. I especially enjoyed the bites that involved figs. It’s hard to believe that I’ve shunned them for so long. I would make this recipe again in a heartbeat. 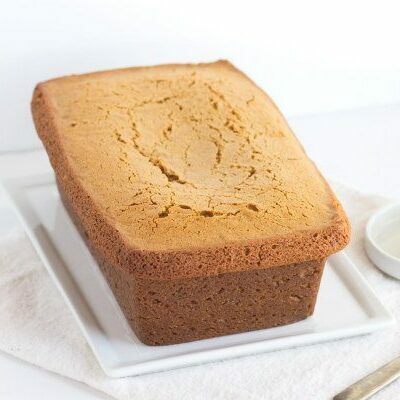 Though it sounds fancy, it’s so simple and completely delicious. My fig phobia has turned into fig obsession. Bring on the fig recipes! Just no fig cookies, please. If you’re looking for more recipes that use figs, you might also like to try my Caramel Fig Loaf or this Grilled Fig Bruschetta. Fresh Figs with Gorgonzola and Prosciutto are super delicious too. 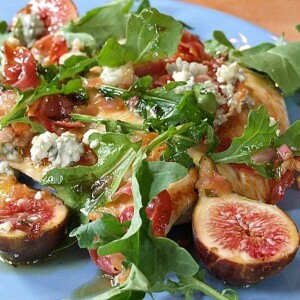 And I can’t wait to try these Bacon Wrapped Figs and this Fig Prosciutto Pizza! A big time favorite chicken recipe! Whisk together all of the ingredients for the vinaigrette in a small bowl and set aside. 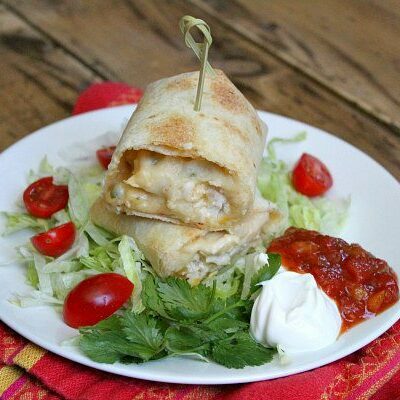 Sandwich the chicken breasts between 2 layers of plastic wrap and pound them very thin with the side of a meat cleaver or a rolling pin. Remove the chicken from the plastic wrap, cut into 4 chicken cutlets and season well on both sides with salt and pepper. Heat a large sauté pan over medium heat. Unroll the pancetta so it looks like big strips of bacon. Add it to the pan and fry it like a tangle of bacon until the fat is rendered, 3 to 4 minutes. Drain on paper towels. Drizzle 2 tablespoons of olive oil into the pan with the pancetta drippings. Add the chicken and pan-fry for 3 to 4 minutes on each side to brown the breasts and cook them through. Use a spatula to remove the chicken to the paper towels with the pancetta. Add the vinaigrette to the sauté pan and heat for a few minutes, stirring, to deglaze the bits of pancetta and chicken from the bottom of the pan; take the pan off the heat. To serve, arrange the chicken on a platter. Scatter the blue cheese, arugula, figs, and pancetta over. 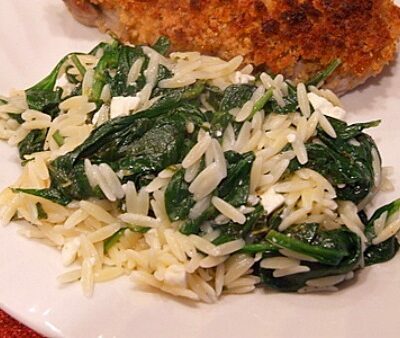 Drizzle the dressing over everything and garnish with the tarragon leaves. 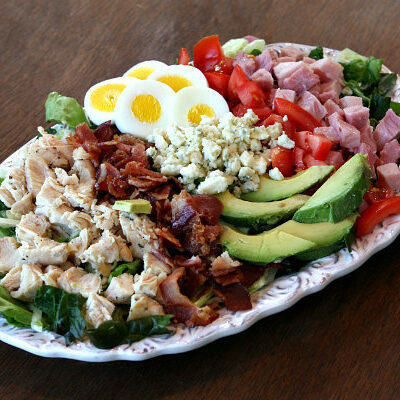 This looks amazing and I am now craving figs too. I have made a copy and this will be on my menu this week. Wonderful inspiration. Just made this for my husband and he loved it! I substituted blue cheese for goat’s.